COLOR! The True Performers | Faddegon's Nursery, Inc. 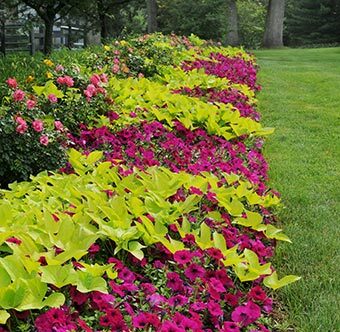 Even though I am a ‘passionate perennialist’, I rely on some workhorse annuals for consistent color beacons May through October. Mind you, I insist that these require little or no deadheading and are not water mongers. 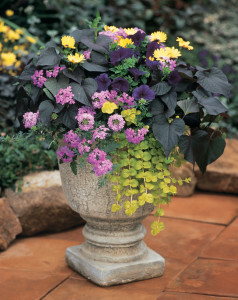 It doesn’t matter if they are in my garden, window boxes, hanging baskets or patio containers. 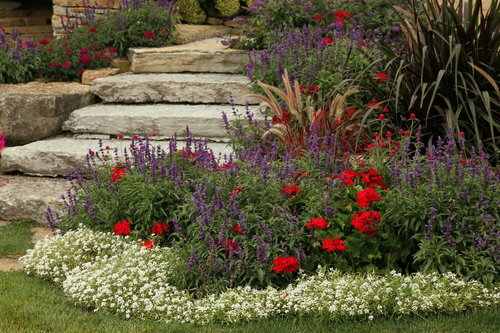 I also refuse to fertilize annuals every few weeks as instructed by Miracle-Gro. 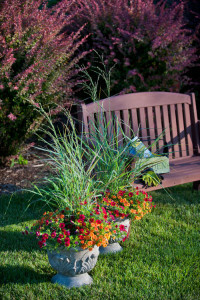 I don’t do this for my perennials and shrubs, so why would I give annuals this special attention? They don’t even ‘thank me’ by returning the following year. Harrumph. The only time I fertilizer annuals is at planting time. I simply add some Osmocote, a time-released fertilizer, when digging them in. This feeds them for three to four months. 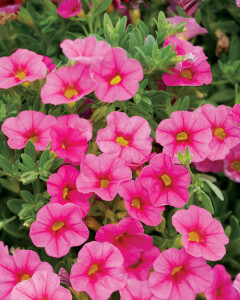 Wave Petunia, Supertunia (Petunia) 4” – 24” tall. Many flower colors. 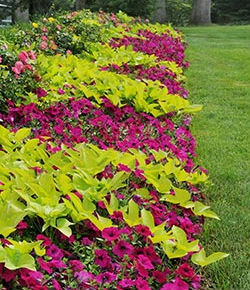 Wave and Supertunias are fast growers and do not require deadheading. Flowers can be single or double. They will scramble along the ground, down the sides of containers and retaining walls, and up chain link fences. 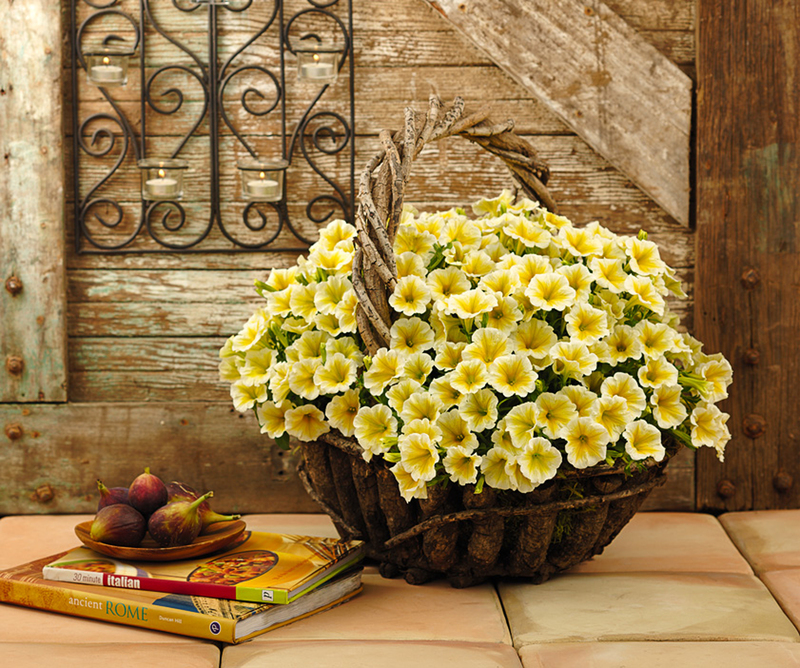 I thought Supertunia® Vista Bubblegum was going to follow me into the house! I planted one little plug on each side of my front steps and they grew faster than any other petunia I’ve ever grown. They morphed into soft pink, blossom covered mounds that were easily two feet wide and 18” tall. Any in the Vista series are equally enthusiastic. Both series have choices that are fragrant, single or double petaled, and mounded or trailing. 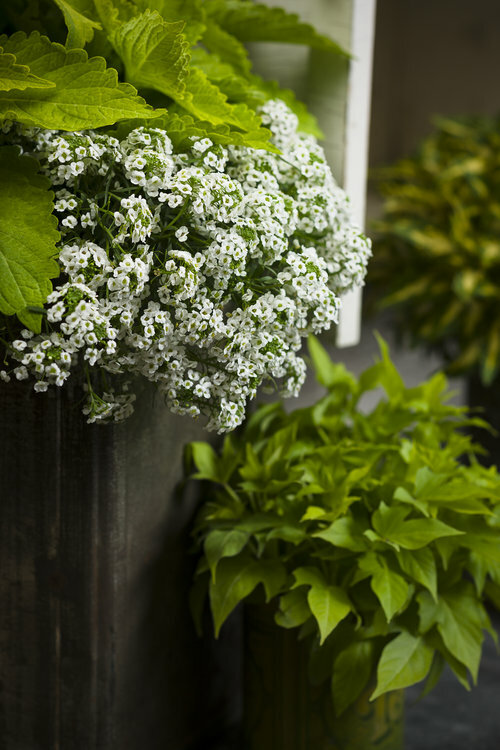 Sweet Alyssum (Lobularia) 4” – 6” tall. White or lavender flowers. I don’t think I have ever been as impressed with an annual as I have been with ‘Snow Princess’. It is a very fast grower, covering itself with masses of white, fragrant flowers that never quit until November when it was slammed by snow. 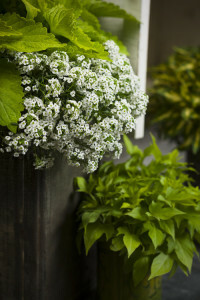 It has a billowing, cascading habit making it ideal for containers as well as along garden edges. Blue Sage (Salvia farincea) 12” – 24” tall. Rich blue spikes and gray green foliage makes this a dazzling blue beacon spring through fall. Annual Blue Sage is very drought and heat tolerant. I pinch my plugs when planting for a fuller figured, flowering plant. Superbells (Calibrachoa, Million Bells) 6” – 8” tall Many colors. There are mounded and trialing varieties. Million Bells are commonly used in containers but they also make brilliant splashes of color in garden beds. Million Bells’ only peeve is soggy soil. This is rarely a problem in freely-draining gardens but containers can be a different story. To minimize this stressful condition, steer clear of glazed containers that hold moisture longer. Go for terra cotta that ‘breathes’ better. 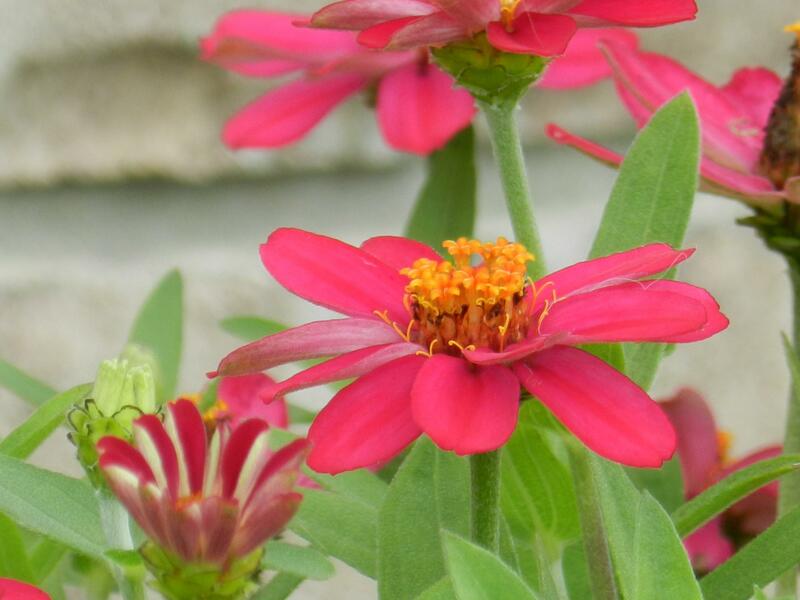 Zinnia (Zinna ‘Profusion’) 10” – 24” tall. White, orange, red or pink flowers. 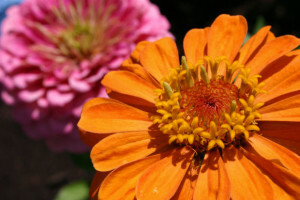 Zinnias are a family tradition; they were in my grandparents’ and Mom’s gardens. I always loved these but hated their propensity for getting mildew and their constant need for deadheading. Thankfully the ‘Profusion’ series came along. These have the same cheerful flowers but compact mounds instead of leggy stems and they are very mildew resistant. Most annuals in this series grow 10” – 12” tall but ‘Profusion Knee High Red’ gets 20” – 24”. Flowers can be single or double. Verbena (Verbena) 6” – 12” tall. 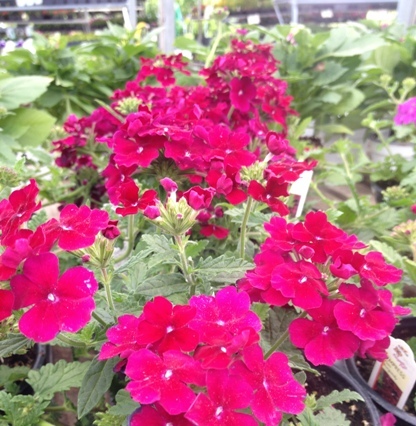 Red, purple, pink, white, apricot, lavender or burgundy flowers. Verbena has a sprawling habit, working well as a spiller in containers or groundcover in gardens. The dome-shaped flowers rest on small, dark green, heavily textured leaves. Verbenas are very easy to grow, doing best with a tough love approach. They usually die from too much lovin’ (fertilizing and watering). 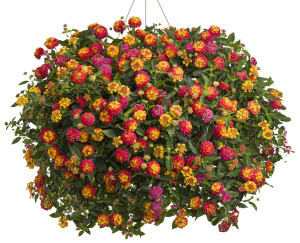 Lantana (Lantana) 12” – 36” tall. Yellow, orange, white, red, lavender or multicolor flowers. The other summer I tried Lantana for the first time. Shazam! Luscious™ Citrus Blend™ knocked me over with its screaming red, orange and yellow flowers plus record-breaking growth rate. 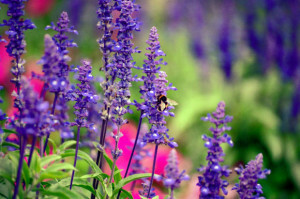 I planted it with rich blue Salvia farincea and the effect was mesmerizing. 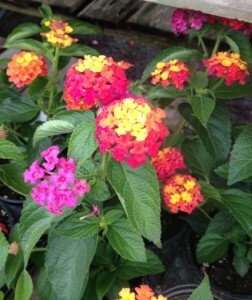 Lantana sneers at drought and heat. 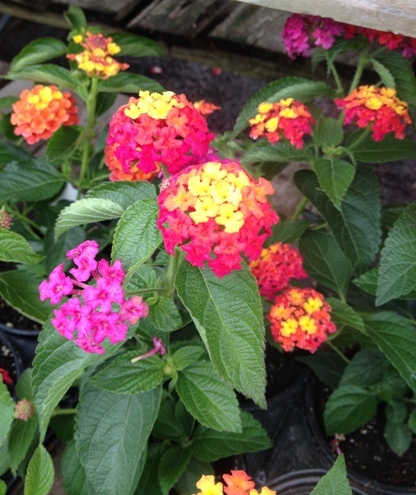 Like many of us as we age, Lantana tends to get wider than taller. Many cultivars can quickly scramble to three feet across. 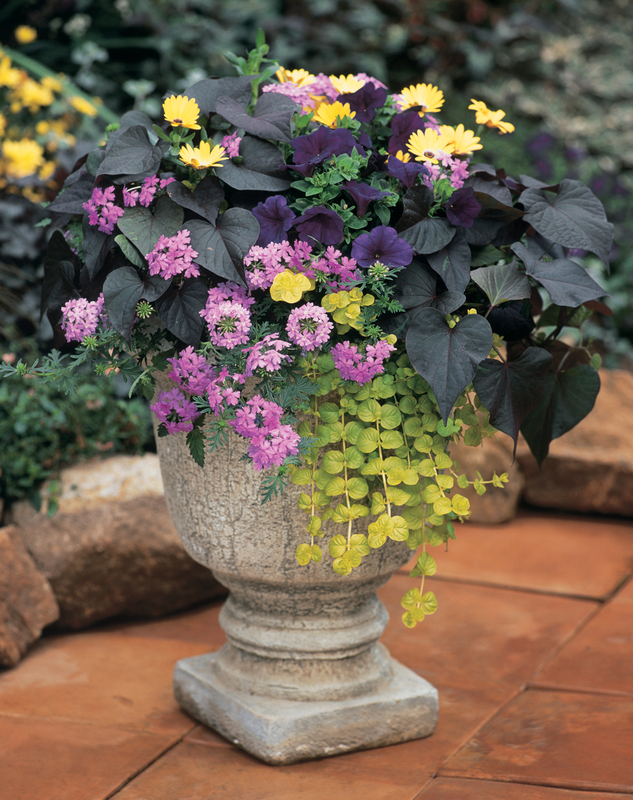 There is a ‘Weeping’ collection with trailing stems that are super for cascading down containers in brutally hot locations.